I don't know if it was a case of "growing pains", or if he was missing B who's away in London (for the birth of the Royal Baby – not! ), or if he was over-tired from all those pre-school activities – or a combination of all three. By bed-time, the whingeing and whimpering had escalated to full-on crying with copious tears streaming down C2's face. What to do? There are no local GPs on duty at 7pm in Sydney and I had no home remedies for achy-breaky calves. I was about to tell him to put a sock in it when the word hit me – "sock". I would steal an idea from B's childhood: the Magic Socks. B must have been around five years old. Much like his son, he used to complain non-stop about his aching legs. Being the youngest of three boys, he had mastered the art of getting everyone's attention, especially his poor Nana whom, I’m sure, he managed to coax into massaging his legs with Iodex. Perhaps he asked her for a hot water bottle, too. Then B's dad had an idea. An idea I think he should have patented. "Go get the Magic Socks," B's dad told his wife. 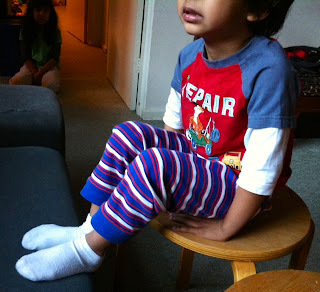 After putting a pair of socks on little B's feet, he advised, "Now go to sleep. The Magic Socks will take away all your pain during the night and you'll be fine by morning." Thirty years down the track, they have worked their magic on C2 once again. He woke up this morning, fit and fine. Bless his cotton socks! Wish I could get an adult-sized pair of Magic Socks myself! P.S. : If you're ever in the need for a pair of Magic Socks, make sure they are a nondescript pair, say plain black or white, which can be easily replaced for a larger pair as your kids grow up! Did your parents ever have to resort to "magic"? What cure-all do you, as a parent, have for your kids' problems? What's the best way to stop your children from crying? Do you have a favourite pair of socks? Thanks Noeline! Hope A and A are well. Wonder if the younger A ever suffered from "growing pains"? My parents didn't have much of an imagination (they're not really storytellers as such) so there were no magic socks involved but I didn't really have growing pains either! Wonder where you got your "story-telling" genes from, Lorraine? I wait in anticipation to read your blogposts every morning, wondering where your opening anecdote is going to take us readers... It's always so much more than the food. My A gets these pains now and then but were more when he was younger. Wish I had those magic socks back then. However, will find them for M if and when required. Here's wishing you a sprinkling of magical fairy dust to add sparkle to your day, Shar! Thanks soooo much for making such an effort, after so many attempts, to post on my blog. You're the best, cuz!